If this card is Special Summoned from the Graveyard: You can banish as many face-up Spell/Trap Cards your opponent controls as possible, and if you do, this card gains 200 ATK and DEF for each card banished. 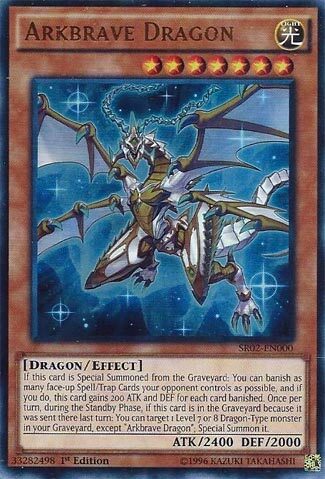 Once per turn, during the Standby Phase, if this card is in the Graveyard because it was sent there last turn: You can target 1 Level 7 or 8 Dragon-Type monster in your Graveyard, except “Arkbrave Dragon”; Special Summon it. Arkbrave Dragon is a Level 7 Light Dragon-type monster with 2400 Atk and 2000 Def. It has 2 very good effects that are not once per turn. Well, the second one is, but only per Arkbrave Dragon. They are also both free effects. The first is when Arkbrave is Special Summoned from the grave, it banishes all of your opponent’s Face-Up Spells or Traps and then gains 200 Atk multiplied by each banished card. This turns a 2400 Atk “Red-Eyes Stats” monster into something much better. It’s a shame that the cards need to have been face up, but it’s certainly better than nothing. The second effect triggers during the Standby Phase the turn after Arkbrave was sent to the grave. You can target any Level 7 or 8 Dragon in the grave for a Special Summon. It just can’t be Arkbrave Dragon, no loops. This includes but is not limited to properly summoned Fusion, Synchro, Ritual, and Pendulum Monsters. A worthy swarm effect and the ability to pump up the Atk stat makes this an excellent side deck choice for Dragons. Our week of randomness takes a turn into some Dragon support with Arkbrave Dragon. Arkbrave is a Level 7 LIGHT Dragon with 2400 ATK and DEF. Stats are solid for a solid level in general. LIGHT is a great attribute and Dragon might be the best type in the game. If Arkbrave is Special Summoned from the GY, you can banish all face-up Spell and Trap cards your opponent controls as possible and have this gain 200 ATK and DEF for each. Arkbrave is great for getting rid of certain floodgates, Field Spells, and Pendulum cards. Also the boost is nice, easily making the stats of this more respectable. Once per turn, during the Standby Phase, if Arkbrave is in the GY because it was sent there last turn, you can revive any Level 7 or 8 Dragon except Arkbrave Dragon. Nice revival effect, meant to work with the Felgrand Dragon that came in the same Structure Deck as Arkbrave, but it can revive something like a Blue-Eyes or Red-Eyes as well. Arkbrave Dragon is a solid Dragon with great potential in the future. Art: 4.25/5 Better than Darkflare Dragon from a decade before. So, my week of randomness (Monday I picked being a DM variant, yesterday just for the name, today was picked just for the art) brings us to Arkbrave Dragon. Dragon, Light, Level 7, with 2400-2000 attack/defense. The 2400 on a Level 7 doesn’t sit well, but he does power himself up if Special Summoned (from the Graveyard) by 200x the number of Magic/Trap cards of your opponents you destroy. They have to be face-up, so that’s kind of a downer, BUT it’s good, and adds balance to Arkbrave I feel. The cards destroyed by this effect are removed from play, which is another nice bonus, and even if you just get ONE, you’re up to 2600 (I’d like two, cause he’d be harder to take down at 2800, but one is good too). His second effect is where he really shines though, in my opinion. If in the Graveyard (and having been sent there last turn) you get to Target and Special Summon a Level 7 OR 8 Dragon in your Graveyard to the Field. Excluding himself, of course. Great for most any variant of the Dragon Deck, and powerful, as well as destructive.